When I look at clothing online, I find myself thinking. I wish that skirt was a little longer. That would be great if it wasn't so low cut. Too bad that's sleeveless. Or worst of all. That is PERFECT but they don't make it/sold out of it in my size. When I do try things on they fit correctly here but not there, too loose and too tight all at the same time. I could have all my clothes altered to fit better. But who can afford that? Several months ago I was introduced to eShakti. I had never heard of them before so I checked out the website. I was intrigued by what I saw. eShakti features retro inspired clothing. Dresses, tops, skirts, cardigans, jackets. All customizable. Customizable? According to my computer, that's not even a word. It's a word at eShakti! At eShakti you have so many options to create the perfect piece for you. Love that dress but wish it was longer or shorter? Change the hem length. Wish the sleeves were different? Change them! Not sure about the neckline? Fix it. Oh, and... The dresses and skirts come with POCKETS!!! Have a personal vendetta against pockets? Why don't you like pockets? What did they ever do to you? Think that embellishment is too busy? You might be reading this thinking that none of the clothes would work for you because you don't wear plus sizes and I obviously do. All of their clothing is available in size 0-36! But wait. It gets even better! Do I sound like an infomercial yet? Because it's all way too good to be true. 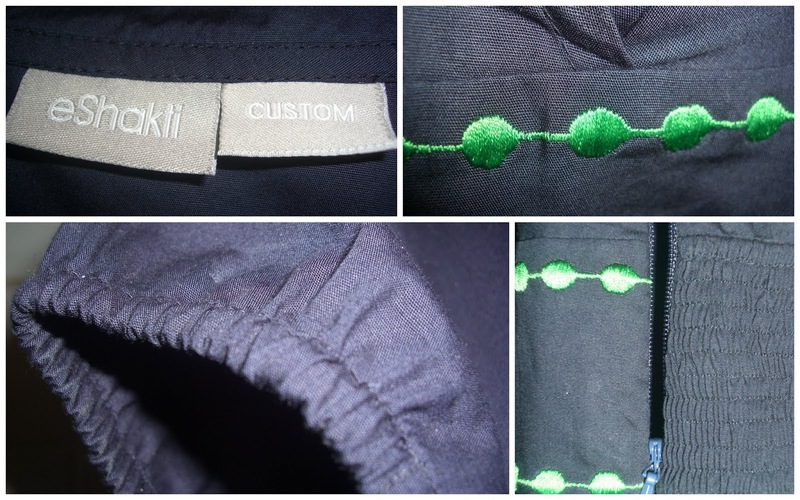 All the clothing can be personally customized to your exact measurements! They don't even cut the pieces until you place your order. That way they can tailor each piece to your exact specifications. Told you it was too good to be true. And you are waiting for the catch now. How much does all this personalization/customization cost? It's really adding up now isn't it? So, their clothes must be pretty expensive to begin with? I found the prices extremely reasonable. They even run sales and have an overstock section. Does all that sound too complicated to you? Don't want to deal with all the measuring? No problem. Customization is entirely optional. You can just order your size. The only measurement you have to give is your height. They even have a bridesmaid dress collection! All this sounds great in theory. But how well does it really work? I decided to find out for myself. After much agonizing over which dress to pick, (I loved them ALL!) I settled on the Cotton Poplin Colorblock Dress in Navy blue/Spring green. I followed the directions on the site and measured myself. Can I tell you how nervous that made me? What if I measured wrong and the dress didn't fit because of my mistake? I left the cap sleeves and below knee length but changed the deep V-neck to a V-neck. Then I waited. I figured I would wait a long time. All that customization should take a pretty long time shouldn't it? 7 days later I received a package. Took me a minute to figure out what it was because I was not expecting it so quickly. Fits like a glove. Actually gloves never fit me that well. The dress fits much better than any glove I have ever owned. It's like it was made for me. The dress is so comfortable! I didn't want to take it off. That's saying a lot for a dress made from a fabric that doesn't stretch. The length is "below the knee" and it hits exactly at the bottom of my knee. I know I shouldn't be surprised that a dress made with my measurements fits perfectly but I have never had that happen before. The dress is very well made. I didn't find any flaws. Not even a single loose thread. I only had one minor complaint. I had customized the dress by changing the neckline to a V-neck instead of a deep V. It seems this was accomplished by placing a snap on the dress. Unfortunately the snap won't stay snapped. I can barely get it to stay snapped long enough for a picture. There isn't much tension on it at all. It just doesn't hold well. Even if it did stay snapped it would be visible because the snap is silver. If it were a darker color it would blend in but the silver shows against the blue. I will probably either remove the snap all together or put in a small stitch to keep it closed. That minor detail aside, I was very satisfied with the dress. In fact, I have already ordered another one. Thank you eShakti for providing quality, affordable, custom clothing for all sizes! eShakti is also offering free customization until 2/28/13 so you can save even more! For a limited time, new customers can also register to receive a $25 gift coupon! Code has to be entered in the 'Promotional Code' box. No Minimum Order Value. The discount code is not case sensitive. The code can be used any number of times until the validity period. This code can be clubbed with any other gift coupon or gift card in the same order. This discount code is not applicable on our Overstock category. Not applicable on previous purchases. *eShakti provided me with a free dress of my choice to try and review. All the opinions in the post are my own honest review and are in no way influenced by eShakti or anyone other than me. This post may contain affiliate ads. Read my full disclosure here.